This Wu-Tang associate knows how to create a hot track. Maybe he and The RZA would be interested in a hip-hop reality show. Hip-hop Alchemy -- a chemical science and speculative philosophy aiming to achieve: (a) the transmutation of vinyl and base metals into gold and platinum; (b) the discovery of a universal cure for the wack emcee; and (3) the discovery of a means of actually utilizing the accounting provision in one's recording contract. Forget NBC's The Apprentice. I'd like to pitch a new reality show. Since the WB and UPN television channels are joining forces to bring viewers more potent doses of Springer and Everwood, they're going to need new programs. The new show could be called The Producer. It could be a twist on Showtime's Interscope Presents "The Next Episode". But instead of recreating the rhyme battles from 8 Mile, my show would take 12 aspiring hip-hop producers and DJs, coop them up in a house with a recording studio, and eliminate them one-by-one to see who can conjure up the best beats. Imagine the wacky competitions -- Frisbee games using vinyl by one-hit wonders, hyped-up challenges (i.e. "Can you mix Weird Al, Anita Baker, and Metallica? "), and no-hands-allowed turntable contests. The prizes: cash, bling, surprise appearances by hip-hop's A-list celebs, and coveted production spots on an upcoming major release. The team with the worst performances would have to eat peanut butter and jelly each week. Actually, scratch the jelly; just give 'em peanut butter. I can hear it now: "Yo, my name is DJ Credit Card, ya heard? I don't scratch, Dunn, I just swipe the record, and charge my competition. I'm everywhere you wanna be, nah mean." Oh, yeah. Since every show needs a host, WB/UPN should call The RZA of the Wu-Tang Clan and leave a message on his Wu-Phone with the financial details. His people will call your people. 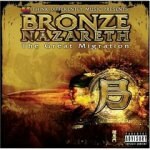 When producer/emcee Bronze Nazareth met The RZA, their encounter might've been something like my dream of The Producer. It sounds like Bronze had one chance to get The RZA's attention. It was do or die. According to the Babygrande Records press kit, the Bronzeman's encounter with The RZA occurred after four roundtrip Greyhound bus journeys to New York City. Bronze, a native of Detroit, Michigan, impressed The RZA with the song "Blowgun", prompting The RZA to invite Bronze to join The Wu Elements production group. Little did The RZA know, his invitation to Bronze would add a marquis player to the Wu-Team (and who knows, it just might've sparked a new reality show in the process). This would be the perfect time for The RZA to do it -- he's scored movies like Ghost Dog: The Way of the Samurai and Quentin Tarantino's Kill Bill. Get him now while he's at the top of his game. The Producer would be a hit. Bronze Nazareth could be one of the judges, along with Easy Mo Bee and Spinderella, and the rest would be kismet. Okay, so The RZA's qualified for the show. Exactly why should Bronze Nazareth be included? Well, for one thing, he's a skilled producer. On his debut, The Great Migration, his production style -- assuming the non-mastered press advance resembles the final version -- varies between rougher, gritty backgrounds and smoother loops. For instance, the first full track ("The Pain") contains horns and a 70s vibe that rivals Kanye West's own "Touch The Sky". Bronze follows that with "More Than Gold" and its rumbling bass line and hard drums. As another example, the smooth jazzy flow of "Good Morning" provides an evocative contrast to "The Bronzeman", a track with enough violins to fit comfortably on the Wu-Tang Forever double disc, back in 1997. One of the best beats appears in "Detroit", a plush jam, with plenty of bounce, fashioned from swirling synthesizers. Meanwhile, "Black Royalty" gets a nomination for Most Creative Music in a Rap Situation as its majestic horns provide the rhythm in the absence of percussion. Compare that to the spirituality and yin-yang dynamic of "One Plan", featuring Byata. "Love your brown shade," says Bronze, "can I write you a serenade? Walk in purple rain, talk amongst the flood plains?" Byata responds to his verses just as sweetly, "You're my king, I'm your queen, you're my son, I'm your earth -- words can't even express how much our love is worth". In some ways, "One Plan" brings back memories of Method Man and Mary J. Blige on "All I Need" from Method Man's 1994 solo album Tical. Yet, the committed-partner approach to the song, while strikingly saccharine, comes off as totally sincere. Other guest efforts mesh well with Bronze's beats and rhymes. "More Than Gold" features Timbo King, while Killa Sin of Killarmy adds a mighty sting to "The Bronzeman". The hardest thump arrives in the form of "5th Chamber", a posse cut assembling 12:00 of Brooklyn Zoo, Sean Price of the Boot Camp Click, and Prodigal Sunn from Sonz of Man. Kevlaar 7 and Phillie help our main man represent his hometown on "Detroit". The hot-potato passing of the mic in this song quickens the cadence. Even though I write vivid like I'm Homer the Greek"
That sums up the tension on this album quite well: just when you think you've got him figured out, he switches things up. Think he's going to lament not being as big as Slim Shady or Jay-Z and not being recognized as the best thing since the cordless mic? Think again. He's more interested in getting heard in his own way and on his own terms. That's why he says, "I'm so underground I play beats on the bones of Medgar Evers". Wow. What can you say to that? But, then again, can those claims to underground status really be true? After all, being a Wu-Tang Clan affiliate isn't exactly the lowest rung on the musical ladder. Interestingly, this album doesn't lose steam in a particular spot or at a specific moment. You can't say, "There it is -- he lost me three minutes into track five." The momentum, lyrically and musically, is consistent throughout but, at the same time, there aren't any tracks that stand out. There's nothing that equals the caliber of "Blowgun", the track that sold The RZA. In fact, clips of "Blowgun", as well as five other songs by Bronze Nazareth, are featured on Bronze's page on the Wu-Tang Corporation's official site. For the most part, the energy in those clips is notably absent from The Great Migration. Plus, although the guest spots are well done, it's hard not to wish for Method, Raekwon, Inspectah Deck, or even The RZA himself to show up and rock a verse. Nevertheless, what you get is a solid, if uneven, album from a top Wu affiliate.